Stem rot of stevia is caused by the fungus Sclerotinia sclerotiorum. Sclerotinia sclerotiorum has a wide host range including Allium (onion, garlic), Brassica (cabbage, broccoli), Cucumis (cucumber, squash), Solanum (potato, pepper), lettuce, sweet potato and other important crops across North Carolina. S. sclerotiorum was first identified on second year stevia plants in 2013. Symptoms include wilting stems that are bleached at the base. As symptoms progress, stems and leaves becomes necrotic. Symptomatic plants often have tufts of white hyphae present on stems. Large, irregularly shaped 2 to 8mm black survival structures called sclerotia can often be observed at the base of stems (Figure 1). Figure 1. 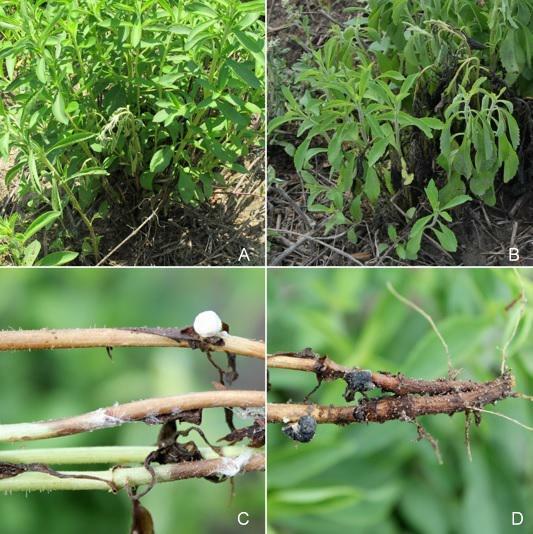 Field symptoms of Sclerotinia sclerotiorum on stevia: (A) Plants displaying wilting and necrosis caused by stem rot (B) Necrosis and death of stems (C) Tufts of white hyphae, young sclerotia, and stem bleaching (D) Mature sclerotia. S. sclerotiorum produces survival structures called sclerotia that are able to overwinter in the soil. In the spring, sclerotia germinate to produce small mushroom-like structures called apothecia that release sexual ascospores into the air. Spore trapping using a semi-selective pH indicator media left open in fields for 1 hour durations identified that spores are released from March-early April in North Carolina (Figure 2). When stevia is grown as a perennial, this spore release overlaps with the emergence of second year plants. Frost damage on newly emerging stems results in tissue that is susceptible to infection by ascospores of S. sclerotiorum (Figure 3). Once a stem is infected, symptoms progress resulting in death of the stem, but there is no secondary spread to other stems within the plant after the window of spore release (Figure 4). Figure 2. 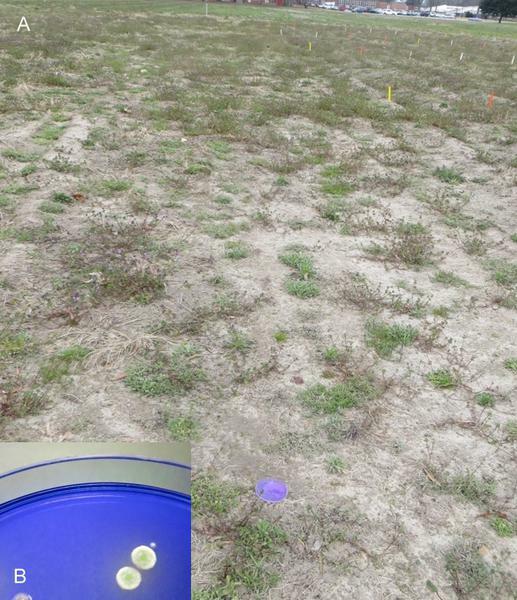 (A) Spring spore trapping in Kinston, NC using a semi-selective pH indicator medium plate (B) Plate with S. sclerotiorum spores. Figure 3. 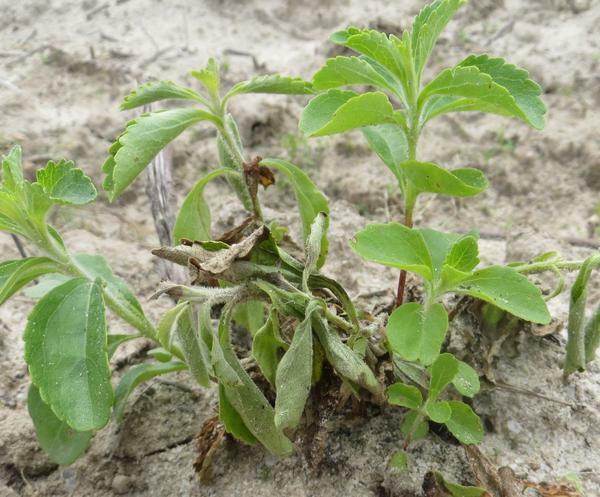 Emerging stevia stems displaying symptoms of S. sclerotiorum infection following frost damage. Figure 4. Symptomatic stems surrounded by health stems in a single plant. In greenhouse production, infection can occur in plants that are being mowed if spores are blowing into the greenhouse (Figure 5). Infected plants typically have stem lesions and white hyphae visible on infected stems (Figure 6). While individual stems may be killed, roots are not damaged and are typically able to produce new shoots (Figure 7). If infection does not occur in the greenhouse, symptoms will not be observed in first year fields since the planting period of May is beyond the window of spore release. In second and third year fields, disease is most frequently reported following frost events as plants are emerging in March-April (Figure 3). At this time there are no fungicides registered for use on stevia. Although individual stems may be damaged following spore release in March-April, there is no secondary spread of hyphae and the use of fungicides to manage this disease is not anticipated. 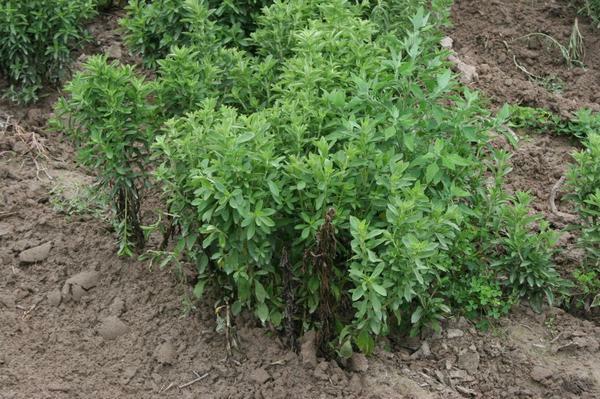 Stevia is a multi-stem plant and new shoots develop and compensate for stems killed early in the season by S. sclerotiorum (Figure 4). Figure 5. Stevia seedling being mowed in the greenhouse before transplant to the field. Figure 6. Stem killed by S. sclerotiorum in greenhouse production of stevia transplants. Figure 7. 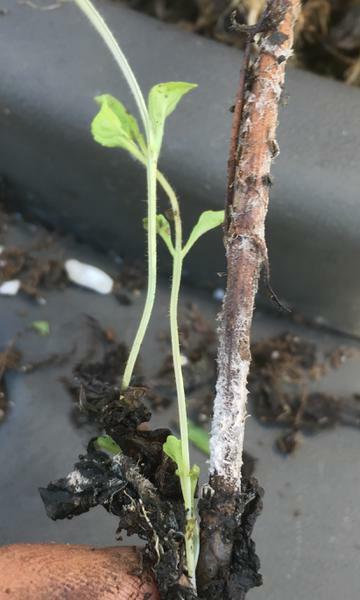 New shoots emerging from a stevia seedling infected with S. sclerotiorum. Koehler A.M. and Shew H.D. 2014. 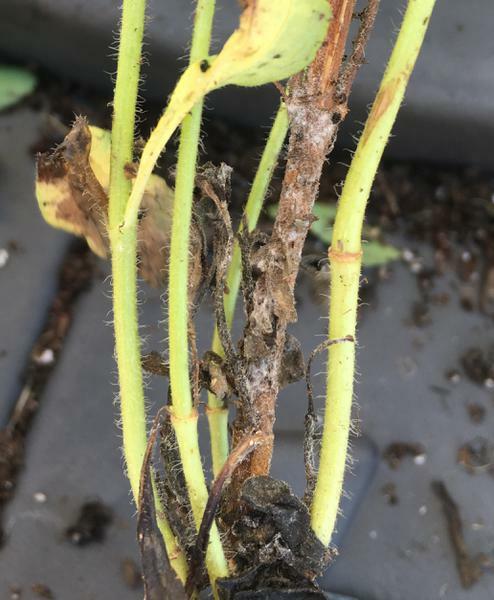 First report of stem rot of stevia caused by Sclerotinia sclerotiorum in North Carolina. Plant Dis. 98:433. Koehler A.M. and Shew H.D. 2017. Disease Dynamics of Sclerotinia sclerotiorum on Stevia in North Carolina. Plant Health Prog. 18: 112-113.